International understanding the Polish way: with Link Up, Krystian "K-Jah" Walczak created a fine example of what fruitful collaborations can look like in our globalized world. Poland meets Germany meets the Caribbean! K-Jah spent the last four years composing, recording, connecting and enthusing fellow musicians for this project that now sees the light of day. Clad in a fine artwork by Tomek Larek & Małgorzata Wójcicka, itbrings to our attention a host of names evenly distributed on 13 tracks plus 3 remixes. Only few of the artists on the list are well known to me. Lutan Fyah, of course, who adds Ur Beauty, a wonderful praise song for the woman of his heart. Shine like a diamond! With Defenders Of The Light, Tamika and Gentleman take a strong stand against war and injustice, the connection to them made by Munich's Umberto Echo studios. Another German contribution, sweet Sara Lugo comes with Little Cloud, a song that talks about the minor daily struggles we all have to face. 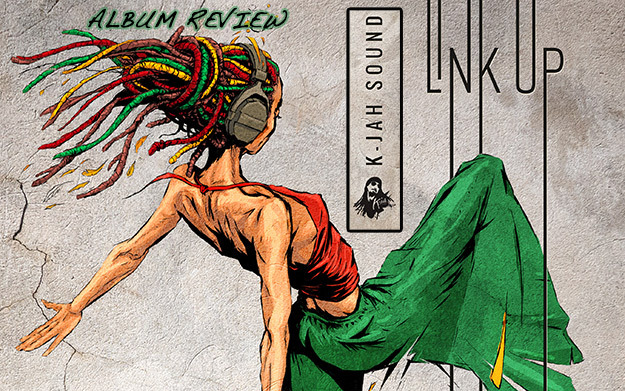 Dubtonic Kru, who can be called a Jamaican Reggae staple by now, accompany a so far unknown to me Dawid Portasz on the two versions Shine On Bright and Wearisome Things. The former is elaborated upon nicely in the Dub remix by Umberto Echo, but I can't really warm up to the latter, which has a strong funk-touch. As for the other singers, only Ras Shaggai (who performs the title track Link Up on a heavy Roots opening) and Runkus ring a bell. His dynamic Run is clearly a gem of the album, well delivered in different vocal flavours by the verstile singer, a wellness re-lived in the final Umberto Echo remix track. The remaining artists seem to be only locally known so far, and not all of them possess the qualities needed for international recognition in Reggae Music. Thus, MadMajk has difficulties to dress the old Missing You theme in new, exciting gowns (the riddim is the same one that Lutan and Anthony Que in The Moment make a great job of singing to). And although his feature with King Kalabash is nice to listen to, the acoustic Sunday Chill merely appeals to me because it's the only version that features some original Polish lyrics. I don't understand what is said, but the authenticity brought aross makes up for that and by far surpasses the meek songwriting efforts of the English contribution. Martyna Baranowska in Rest and Shana S. with I Love You ride on the same jazzy riddim, bringing in some female soul vibes. Both are good singers, but Martyna really manages to spark the track with that little extra that makes it a special cross-over. Another highlight of the album, Love Is Givin' Freedom by Jahlove is using the Sweet Love Riddim that helped push K-Jah's succes and popularity two years ago. Good voice, great message! For those who enjoy a wide variety of styles, jazzy hues, lots of saxophone and experimental approaches, this release will be a great discovery, as it is no ordinary Reggae Album. The contributions of lesser known artists offer an interesting excursion into the Polish Reggae scene, a scene you should definitely check out in more detail. Bardzo dobrze, K-Jah!